Seiko’s ‘active matrix’ E Ink watch will be on sale by end of 2010 — Engadget – this might be the watch to replace my casio wave-ceptor WV-58U. I say *might* because I'm quite attached to my watch. Was on a Stag last weekend for Chris (you know who married Liz the other week). Yes I know it’s a little backwards but when the stag and hen’s were planned the wedding date wasn’t known and they didn’t know a date would free up so soon. So for Chris’s stag we went out in Cardiff. I’ve been to Cardiff a couple of times, but none really since ‘adulthood’. So I’ve not experienced going out there and didn’t really know what to expect. I was surprised at how some cities become magnets for stag and hen nights out. It’s weird and you can’t really explain how it happens. But Cardiff is one of those places. We were staying in a hotel that specially caters for it, just as well being above a nightclub as I can’t imagine who else would stay there. But yeah lots of fun it was a good group, most of whom I know pretty well. On Sunday we went to watch England v Pakistan at Twenty20 Cricket, we won so that was good although we were worried the match might have been rained off. A little while back I decided to get into electronics. I never really did much while I was at school, I was more into computers but about a year ago I bought myself some bits and a USBasp to program chips with but I think life caught up and I never found the time to learn about it properly. I still have the programmer somewhere but I never really learned how to use it. 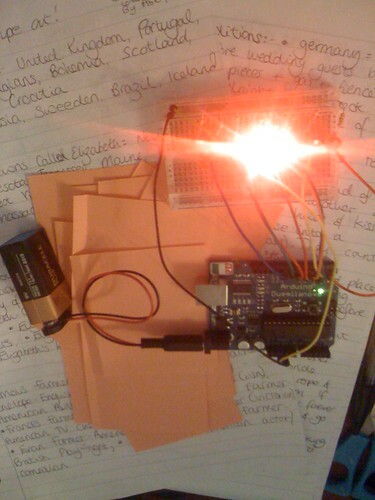 So once again i’ve caught the bug, this time discovering Arduino. It’s an open source development board and IDE. It’s a little friendlier to use and there’s huge swathes of information about it on the internet. It’s more of a system around the chip than a way to program just the chip itself. Within a few minutes I was able to assemble a couple of circuits and modified some code I found for a cylon scanner. Take the arduino off the usb and plug in a battery instead and voila, so simple! I’ll post the code up later, it’s stuck on my home computer. So I have a couple of ideas and hopefully I’ll get time to make them a reality!